Agribusiness giant Monsanto is strengthening its hold over the food system both in this country and abroad, with some help from the U.S. government. Food safety advocates have been trying to derail the roll-out of the company’s newest product, Roundup Ready alfalfa, or at least limit its use, Mike Ludwig reports at Truthout. But Secretary of Agriculture Tom Vilsack announced recently that use of the alfalfa seeds would be fully deregulated and available for use across the country. “The decision squashed a proposed compromise between the biotech industry and its opponents that would have placed geographic restrictions on Roundup Ready alfalfa to prevent organic and traditional alfalfa from being contaminated by herbicide sprays and transgenes spread by cross-pollination and other factors,” Ludwig reports. 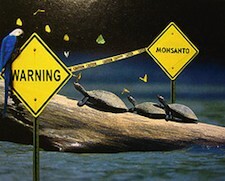 President Barack Obama’s food safety and agriculture team includes quite a few Monsanto supporters. Michael Taylor, the deputy commissioner for foods at the Food and Drug Administration, worked on public policy for the company for three years, for instance. And the agriculture department’s chief scientist, Roger Beachy, came to administration from a research organization co-founded by Monsanto. Obama administration officials are also working with Monsanto on a plan called “New Visions for Agriculture,” which promotes global food security, Kristen Ridley reports at Change.org. For the developing countries involved, the pitch for food security might sound good now. But the United States doesn’t have a great track record when it comes to international interventions on behalf of corporate interests. In Colombia, for instance, local activists are pushing back against a new Canadian goal mining project in part because their communities have already experienced environmental destruction at the hands of U.S.-based mining interests, Inter Press Service’s Helda Martinez reports. While GreyStar, the Canadian company pushing the project, has promised it will not harm the environment, leaders like former environment minister Manuel Rodríguez are pointing to similar claims made by U.S. coal companies in the past. “The U.S. firm ‘Drummond told me the same thing 20 years ago,’ Rodríguez said,” according to Martinez. “The former minister was referring to the proven environmental damages caused in the northern province of Cesar by Drummond’s coal mining — a disaster compounded by serious allegations of violations of the human rights of local residents and mineworkers,” she writes. As Eartha Jane Melzer reports for The Michigan Messenger, here in the United States, some lawmakers are pushing back against Canadian interests, as well. Bruce Power, a Canadian nuclear energy company, wants to ship “16-school bus sized steam generators from the Bruce Nuclear Station on Lake Huron to Sweden for reprocessing and reintroduction to the commercial metals market,” Melzer writes. The generators would pass through U.S.-controlled portions of the Great Lakes. A cadre of senators from states touching the Great Lakes (Pennsylvania, Wisconsin, Michigan, Illinois, and New York) have asked the agency responsible for approving the trip, the Pipeline and Hazardous Materials Safety Administration, to take a close look at Bruce Power’s application. Check out Butler’s account of her hunt in Georgia. She also learns that the attitude towards the pigs—and invasive species in general—goes beyond a desire to simply be rid of them. “In Florida, the spiny iguanas are pests, but they’re also kind of pretty, so some people kind of like having a few of them around and object when people try to get rid of them,” she writes. For 93 years, Koppers, Inc. operated a wood-treatment facility at 200 NW 23rd Ave, releasing industrial toxins—including arsenic, hexavalent chromium, creosote, and dioxins—into Gainesville’s air, water, and soil. The area is now ranked as one of the nation’s top-100 polluted sites. It has been designated a Superfund site—a place so heavily polluted with toxic waste that it poses a threat to human health and the environment—for 27 years. Even so, the area has yet to be fully cleaned up, and families live in close proximity to the site, worrying about their health and warning kids to stay away from the area.